What a wonderful milestone turning 100 is, that definitely deserves to be celebrated. Invite family and friends to celebrate this wonderful birthday. Hand out 100th Fanci-Frames as a party favors to your guest as a keepsake to remember that day. 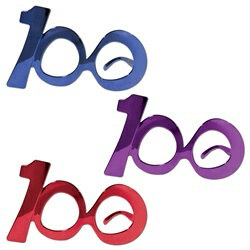 The 100th Fanci-Frames come with one (1) per package, in assorted colors. Sorry specific colors cannot be requested. The 100th Fanci-Frames are plastic novelty glasses that don’t have lenses. When wearing them you look through the 00’s to see. We also have Fanci-Frames in other mile stones that include 30, 40, and 50.